'Sweet Summer' gives a heavy crop of large, sweet and juicy berries. It's an 'everbearer' variety which will fruit throughout summer in autumn, each plant producing as much as a kilo throughout the season. As the growing plants produce few runners they stay nice and tidy and are perfect for container growing too. Plants are not troubled by disease and very easy to grow. Supplied as a pack of 20 fresh bare rooted runners, ready to plant straight out. Here's a great new strawberry variety that's just packed with flavour! 'Sweet Summer' gives a heavy crop of large conical berries which are firm yet superbly sweet and juicy. It's an 'everbearer' variety which means the plants are not affected by day length and so just keep on cropping right through summer and into autumn, often as late as the first frosts, each one giving as much as kilo through the season so you'll pick loads from this pack of plants. As the growing plants produce few runners they stay nice and tidy and are perfect for container growing too. Plants are not troubled by disease and very easy to grow. 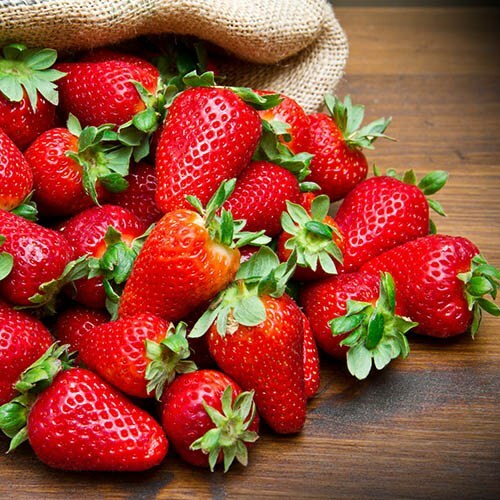 If you are looking to pick sweet juicy fruit throughout the warmer months this is the perfect strawberry to choose. Delivered as fresh bare rooted runners. Plant as soon as conditions allow. If ground is frozen or waterlogged keep in a cool place and ensure roots remain moist until planted.